This wonderful cabin is designed to provide maximum enjoyment throughout and boasts one of the best long-range views in the Blue Ridge Area! 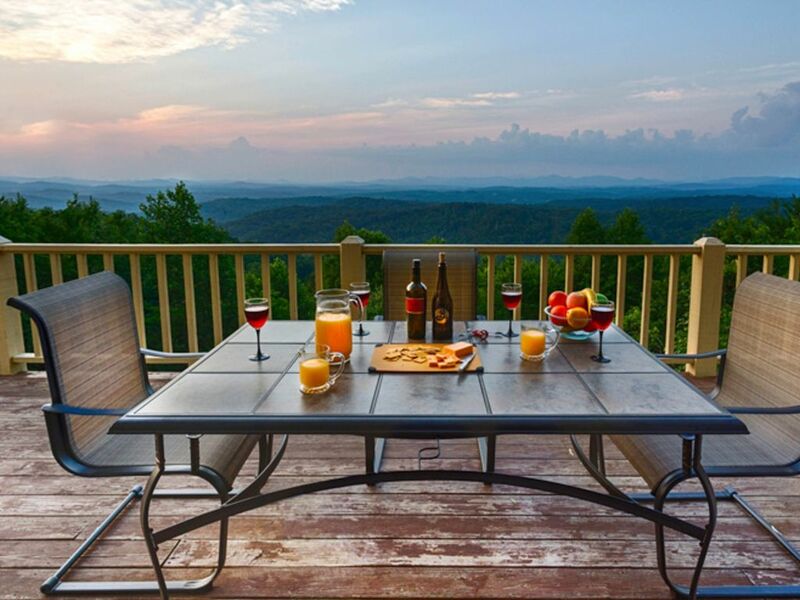 Relax on the deck or the private screened porch; read by the fireplace or unwind in the private hot tub as you soak in the view; and dine inside or on the deck while gazing out across the majestic Blue Ridge Mountains. Located in a quiet neighborhood, just a short drive from picturesque hiking trails, rolling rivers, and cute shopping spots, you won't have to go far to dive into the fun! The vaulted wood-beamed ceilings and spacious open layout allows everyone to enjoy a bit of privacy during their stay. With all of the amenities of home like a private washer/dryer, central A/C, cable, DVD player, and free WiFi you can relax without worry. Sink into the bubbling hot tub while you take in the expansive views on the deck. Fire up the gas grill or use the well-equipped kitchen to make everyone's favorite dish. After dinner, play a game of billiards on the private table or break out the provided board games. With adventure at your fingertips, this Blue Ridge vacation home is the ideal spot for your next family getaway. Parking Notes: Paved access & parking. Can park in the gravel area on either side of the road. Enjoyed our Spring Break in Blue Ridge. The cabin was beautiful and well kept. Our family enjoyed the Hot Tub, pool table and relaxing on the amazing back porch. Convenient location with great views. Will definitely book again! My family loved our Spring Break in The Cloud Lodge. Very clean and well kept. Our family enjoyed playing pool, the hot tub and the most amazing view from the back porch. Definitely coming back. Blue Ridge was a great town with fun shops and awesome food choices. Great home. Stayed with my husband. Enjoyed the hot tub and the magnificent view! House was just like the web pics depicted. Very quiet, lots of games for kids. View is wonderful! Close enough to downtown venues, and hiking/rafting activities, yet you are on a high mountain escape get away. Very clean, and beds were comfortable. Lots of room. Pool table fun. We felt right at home. No unexpected surprises. Great family 2 night stay. Blue Ridge downtown is a fun downtown. Something for everyone to experience and enjoy. The local owners of the shops very plesant and friendly. Waterfall hike was fun too! We will return. We loved this home! The views are beautiful even though the weather was kind of crappy! Everything in the home was lovely & we had everything we needed for a wonderful relaxing weekend! The bed was very comfortable. We would definitely love to come back when the weather is a little nicer so we could enjoy the beautiful porch!